Sitting in a caravan, in a thunderstorm, by a rising river, watching ducks enjoying themselves while eating an Indian take-away. Good food, good company – and a little edgy on account of the weather conditions, however that all just added to the event, a memorable meeting to be sure. Andrew Taylor-Browne, Mugo and Adrienne Hodges by the river in Haydon Bridge, Northumberland. A rare meeting. Nigel, Andrew, Mugo, Adrienne and three quarters of greyhound. It’s been wonderful to spend time with Adrienne, Andrew and Nigel – and doggy too of course. I’m refreshed and renewed, as if I’d been on holiday for a week. Thank you. Note the Rowan tree in the background, right. If these Rowan berries were beads, strung together as a rosary, the telling of them would be my wish. The reciting/writing the stories they hold, as they pass through my mind, a pleasure. The first would be to tell about my day. This day. This holiday week-end Adrienne and Nigel are camping in their caravan not far from the monastery. They are right on the edge of the South River Tyne with ducks marching about like they own the place. Perhaps they do. This afternoon we walked a section of Hadrian’s Wall, high up. Views to Scotland, bleak. Views south, bleak Northumbrian moors. So good to be up high, to survey the utter countrysideness of this expanse. The berries? Rowan in abundance. Everywhere. 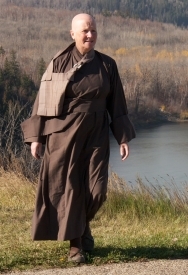 A sunny walk with a fellow monk along the East Allen River last Monday. Like another land in comparison to our familiar West Allen Valley. You know, if you were not here I’d think I was somewhere else! she said as we churned up a hill with pine and wide views. Spontaneous appreciation is a pleasure to walk with. Quite so, I thought, and laughed out loud with pleasure. What of that expedition to London several weeks/centuries ago? Over night accommodation in a (former) prison cell no less! The cells small (approximately 7.5 ft by 5 ft), warm and private. Bedding and towel provided. Slept soundly, rested securely and bathed in the clear air of the Jamyang Center, sited in a former Court House south of the river. Convenient location for travel by tube, bus or train into central London and beyond. It was this review by Anthony Gormley that had me, while in London, adventuring underground on the ‘tube’ to the Victoria and Albert Museum. The acceptance in an image like this – of the fundamental stillness of sculpture and its ability to stop life in its tracks – is what makes the greatest Buddhist images so potent but not overpowering. These pure images become an invitation to another form of existence, and evoke the core of Buddhist practice dealing with time, space and consciousness. The newly opened Robert H N Ho Family Foundation Gallery of Buddhist statues is…there. Appreciate, bow, linger a little, linger a little longer. I did, and I’m glad I did. Once called The Place Below, to be relaunched in October as Cafe Below, is…below! We’re located in the Norman crypt of Sir Christopher Wren’s famous St Mary le Bow church, in the heart of the City of London, home to the famous Bow Bells. Met a friend and her grown up daughter for lunch. We shared a bedsit in Manchester in the (swinging?) sixties. You haven’t changed a bit. You are still the same you… she said. Gratitude renewed for this woman’s influence in my early life. She taught me how to wallpaper, how to sew my own cloths and above all how to laugh, inside and out. Let’s see now. Are there any other beads to tell on my Rowan berry rosary? Perhaps this is enough to be going along with for this evening. There is more than enough material to follow up via the links. For the rest there are the very many emails and phone conversations and face to face meetings which have made up my weeks. If there is a theme to this rosary, in and out is the flowering of creative confidence. One email came with gratitude, which touched me: (thank you for the)…support that leads to me finding myself just doing things that I thought I could never do, and enjoying it! Yes, this has been the theme these past weeks – a growing sense from people I’m in contact with of their blossoming. It is right that it be so. I’m told that there are three more talks to listen to on the Throssel website. They are in a subsection called ‘3 talks from the summer retreat period 2009’. Since the retreat period is due to end tomorrow these will be very recent talks. Travel safely all of you who are on the road, in the air or however it is you are transporting yourselves. Unfortunately our internet connection is still very slow consequently postings are rather slow in coming too.